You then discover your insurance doesn’t cover sewage problems, thus setting you back $250 dollars (Only to have the issue arise again three weeks later, but we aren’t talking about that. Just keep imagining). Upon arriving to work you discover you’ve left your wallet (No lunch). And, to finish it off, you’re confronted with blue lights upon returning home. (You were just trying to find a place to pee, and, if you were swerving, it was because…well, look what kind of day you had! This all happened in November, on the same day, all while trying to complete the Nano challenge. However, more recently than that, just three days ago, I misplaced my keys. Scrambling round, trying to figure out where the WORLD they could be, I feared I’d finally lost my mind. Elated to find them–three days later, beneath a stove burner–I set out to run errands. Except there was a problem. “You know your tire is on a flat,” Dad yelled, backing out of my driveway. So, I went to a station, aired the tire, and discovered a huge nail in the tire. Isn’t this a depressing post thus far? Let’s get to the good part. Life is full of irony and surprises. Take your present, your “unpleasant surprise,” or whatever ya wanna call it, and smile; find a way to make good of the experience. Move on. Just hearing the sound of little ones running about and giggling creates a sense of nostalgia. Once upon a time, life was easy, simple, and fun. Why not find that place again. It is a scientific fact; music saves lives. Whatever your ailment, I bet you there is a song for it. I have my favorites: Golden Girl’s, Everybody Loves Raymond, The Jefferson’s, House of Payne, anything that brings out the ha-ha in me. I balked at this one, especially when the gym instructor said, “Come before work; trust me, you’ll have so much energy afterward.” I thought, “I’m already tired; why be exhausted before work?” However, dude was right—instant energy booster. Speaking of wit, Sophie Kinsella is my go-to author when I want light, funny, and poignant, with a hint of mystery. She is a chick lit novelist, but there are always some deep dark secrets lurking about, wrapped in hilarious text. Try “I’ve Got Your Number” or “Remember Me” for starters. I also enjoy inspirational pieces, such as those by Karen Kingsbury and Patricia David. The end all, be all, and cure-all. Having the type job in which vacations come with so many restrictions I might as well take random days in January, I’ve created some outlandish retreats, preferably the Twisted Retreat, taken some time in June of 2010. Totally imaginary—no passport, money, or luggage needed. *Your turn* What is your go-to method of dealing with stress? Writing isn’t my only love. In fact, I’m not sure which came first in my life–writing or music. Let’s see, I wanted to play guitar and take dance lessons sometime before pre-K, and as soon as I learned how to place my alphabets correctly on the little blue dotted lines, I began creating stories. Still, if you think about it, it looks like music came first. However, my introduction to Miles was somewhat of an accident. I decided to buy Kind of Blue because…well, it fit my mood at the time. My best friend was getting married and I was a little melancholy, unsure of how it would change our relationship. Every evening, I’d light a citronella candle, sit outside, and write about the upcoming change in our lives, all while listening to Miles. Ironically, that CD was also the introduction to my husband. Yep, the best friend got married. And later, I got married. But before that, I met Future Hubby in the CD section of a retail store. I was looking for more of the jazz genius I’d been listening to for the past couple of months. Future Hubby’s words were, “what you now about Miles Davis?” Of course, the man who is now my husband had tried several times before then to get me to call him and go out with him, but something about him challenging me with a music question struck a chord. From there ensued a debate. And then a date. Soon came marriage and children. I’d put the kids to sleep with Kind of Blue and Love Songs by Miles. Somewhere in there, one night while I was asleep, I heard a horn, a distinct pitch, a sound that only Miles could create. I looked up. I’d fallen asleep with the television on one of those music channels that play all night. Solea, it read at the bottom. By Miles Davis. I knew it! But where, on what CD? Obviously one I didn’t have. 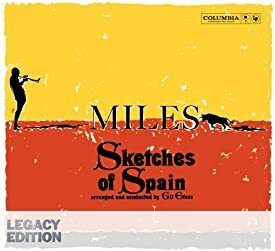 I adjusted my eyes to the blue light of the television screen–Sketches of Spain, the words read. I had to find it. F.Y.I: If you’ve never heard it and you like jazz, go get it. Art comes in all forms, not just books and poetry.